Three posts in a week – that must be a record for me. With the Bendigo Sheep Show over for another year it’s time to tidy up, make a plan and get on with it. The first thing I did was to tie the warp back on to the small loom and, as I straightened up after dropping the fishing weights on the floating selvedges, I felt my back go. Fortunately, my physio could fit me in the next day and strapped it back together, not sure if the effect is real or psychological like giving a band aid to a small child who’s not bleeding, but fortunately it’s all back to normal. I decided to finish the trial jacket I started for my entry for the sheep show last year – it just needs the facing and the lining attached so not a lot of work there – so I had a look in the mystery cupboard under the stairs and found the bag with the pieces, but I got distracted and there hasn't been any progress yet. 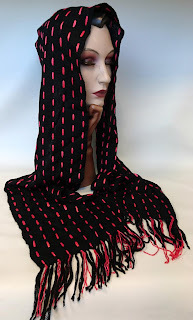 While I was looking in the cupboard I found another bag of weaving UFOs and as there is a market this Sunday and not enough time to start anything new, I decided to investigate. There was a black and red scarf, just the thing to go with the new coat and with the sort of long floats that mean that it’s all mine because selling or gifting it to someone is just not an option. 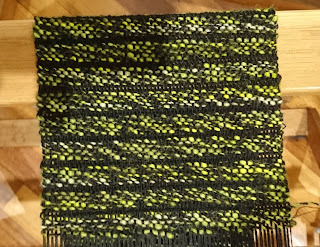 The next thing I found was an almost complete advancing twill scarf with a handspun weft – all the fringe on one end and about 2/3 on the other end were done. It just needed the rest of the fringe done, a few repairs and a wet finish. At least there will be something new for the market. 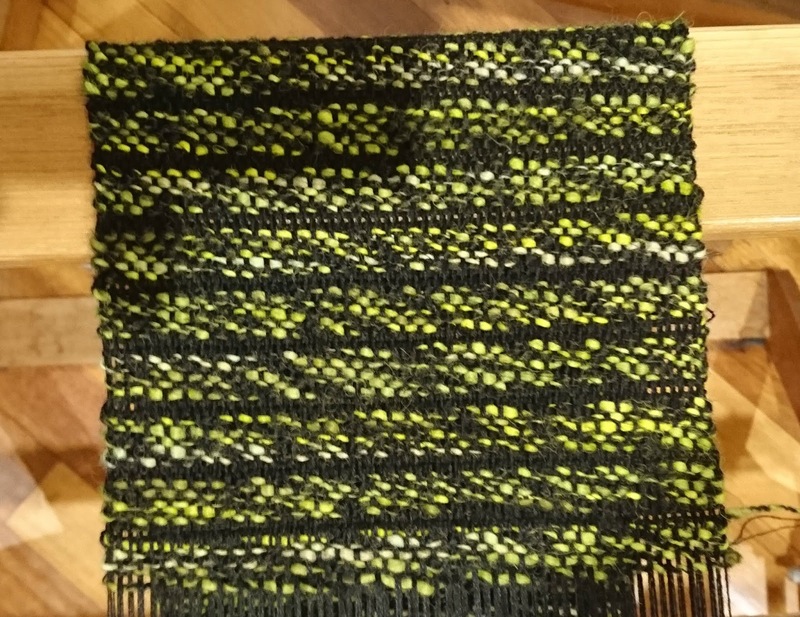 I looked a little further and found an acid green alpaca scarf which had been beaten too firmly so that it was more like a table runner than a scarf. 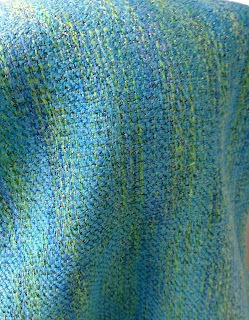 The alpaca yarn was too good to discard so I took it apart and used it with the warp on the small loom, beating gently this time. It should be done by the weekend as long as I don’t have any more of the surprises I got when I released both rachets on the loom at the same time. The remainder of the warp unrolled itself off the back beam almost instantly, then fell off the rod as well. I managed to restore order, the tension is a bit tight on one side but should hold OK for the last few inches. 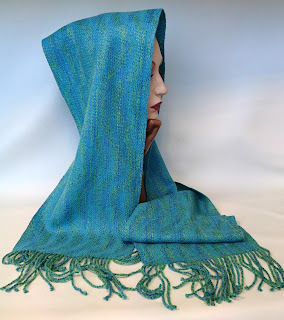 Some fringe, a quick wet finish, hope it will dry overnight and there should be 2 news scarves for tomorrow. 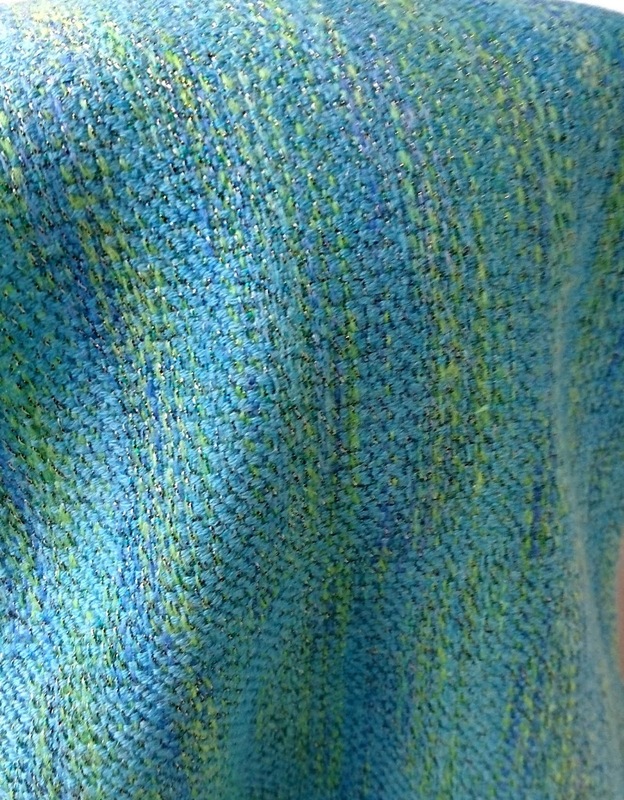 Then, after the market on Sunday I can move on the tea towel warp, inspired by the lorikeets in the garden.